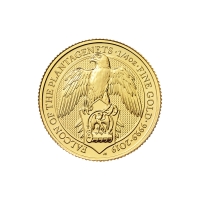 Order your 1 oz 2019 The Royal Arms silver coin and enjoy the lowest price at our online store! 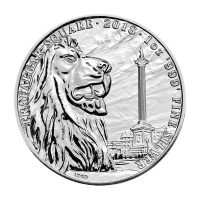 The national symbol of pride, heritage and monarchy, originally produced by Eric Sewell has been re-imaged by famed designer, Timothy Noad on this stunning 999 pure fine silver coin. First established in the 14th century, the Royal Arms serves as an emblem of identity to this day, featuring on passports and other government issued documents. 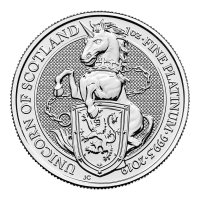 The reverse features Timothy Noad’s rendition of the United Kingdom’s coat of arms, an unrestrained lion on one side, symbolizing England, with a majestically beautiful unicorn, representative of Scotland on the other. In the middle a crown adorns a shield, which features three crouching lions, further distinguishing England, and a harp for Ireland, with the modernized feature of a leek for Wales. The coat of arms is displayed on top of a light refracting, micro-engraved, starburst field. The Obverse holds Jody Clark’s right facing effigy of Queen Elizabeth II in Addition to the Queen’s title, and denominational value. The Royal Arms have been the premier symbol of authority, utilized by monarchs as well as heads of state with pride, glamour, and success are all encompassed within. 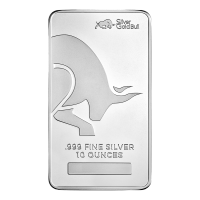 Diversify your holdings with this highly liquid 1 oz 2019 silver coin, from one of the most recognizable mints on the globe! Obverse Jody Clarks effigy of Queen Elizabeth II. Reverse The royal arms as imagined by Timothy Noad. Jody Clarks effigy of Queen Elizabeth II. The royal arms as imagined by Timothy Noad. 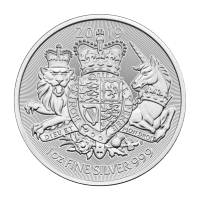 1 oz 2019 The Royal Arms Silver Coin Order your 1 oz 2019 The Royal Arms silver coin and enjoy the lowest price at our online store! 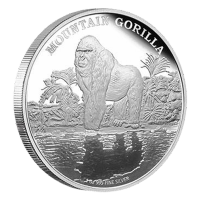 The national symbol of pride, heritage and monarchy, originally produced by Eric Sewell has been re-imaged by famed designer, Timothy Noad on this stunning 999 pure fine silver coin. First established in the 14th century, the Royal Arms serves as an emblem of identity to this day, featuring on passports and other government issued documents. 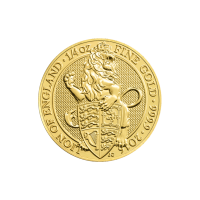 The reverse features Timothy Noad’s rendition of the United Kingdom’s coat of arms, an unrestrained lion on one side, symbolizing England, with a majestically beautiful unicorn, representative of Scotland on the other. In the middle a crown adorns a shield, which features three crouching lions, further distinguishing England, and a harp for Ireland, with the modernized feature of a leek for Wales. The coat of arms is displayed on top of a light refracting, micro-engraved, starburst field. 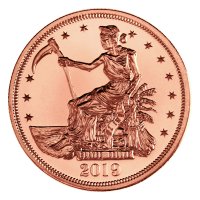 The Obverse holds Jody Clark’s right facing effigy of Queen Elizabeth II in Addition to the Queen’s title, and denominational value. The Royal Arms have been the premier symbol of authority, utilized by monarchs as well as heads of state with pride, glamour, and success are all encompassed within. 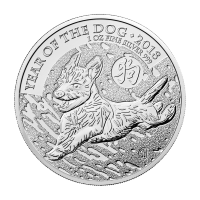 Diversify your holdings with this highly liquid 1 oz 2019 silver coin, from one of the most recognizable mints on the globe!